In a city world-famous for its vibrant artistic culture, it’s no shocker that New Orleans also goes big when it comes to fanatical devotion to our hometown football team. 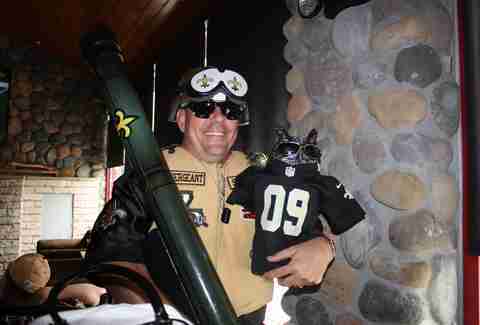 But some Saints fans take their fandom more dramatically than others, resulting in the oft-celebrated costumed revelers in the Superdome on Sundays. 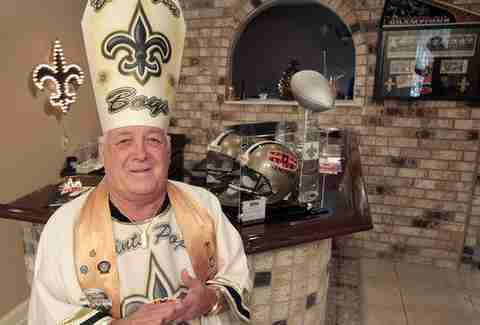 In fact, some say that the entire genre of superfandom was actually invented here, when one fan decided to dress up as the Pope to attend a Saints game back in the 1980s. Not all superfans are created equal, so we’ve ranked them according to their intensity, devotion, effort, and possibly insanity. A logical extension of the Batman Saints theme, Dat Girl has a loyal local following, not least because she’s actually married to another superfan, the Mad Datter. Given the franchise, why go with the less-than-remarkable Batgirl and not Cat Woman (Dat Woman!)? Points for effort here, but we’re still happy to have you in the stands cheering our boys, Dat Girl. We Asked Lil Jon What He’d Turn Down For, Because… Why Not? You don’t often think about Broadway and the NFL at the same time, but it’s hard to dismiss classic theatrics when you’re a superfan. We have to hand it to the Phantom, who tends to be significantly less mopey and vengeful as a Saints fan than his literary and musical counterpart from Phantom of the Opera. Plus, you have to admit, that mask is pretty fierce. 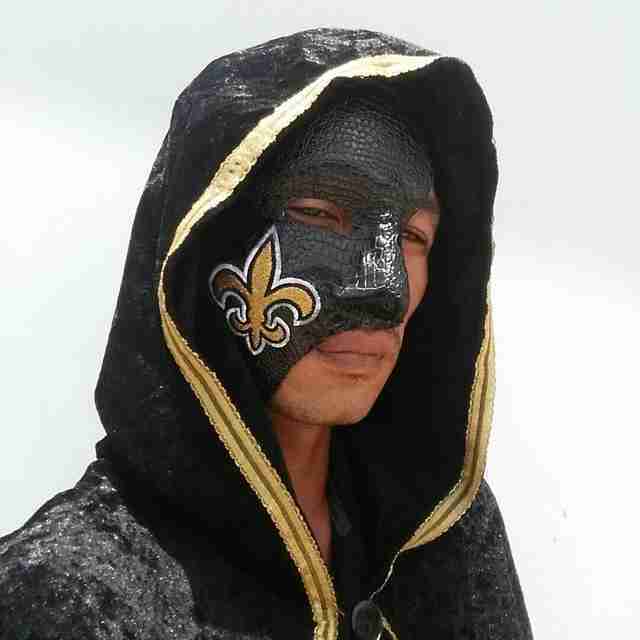 It would be ridiculous if at least one Saints fan didn’t get into the spirit of the football season by combining NOLA’s love of Carnival with our love for all things black and gold. Saint Jester wins points not only for his harlequin outfit and jester hat, but for reflecting the traditions of the city both new and old. The only animal who makes this list actually became a superfan as a matter of happy coincidence. When the cat’s owner, Randy Pumilla, took his service animal Zoey to a game, he didn’t expect that her black, gold, and white visage would nearly instantly make the feline Internet-famous. Since then, she’s become a beloved fixture at home games, even inspiring a Who Dat Cat meet-up at the Breaux Mart on Magazine St. 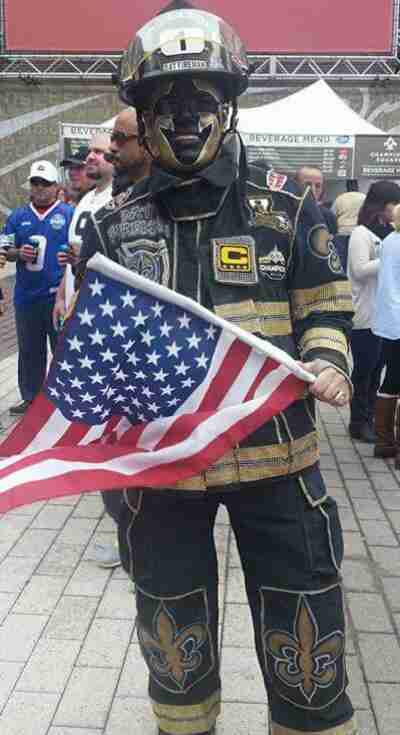 While this guy isn’t the first NFL fan to appropriate firefighter gear into a superfan persona, Dat Fireman holds a special place in our black & gold hearts for a couple of reasons. 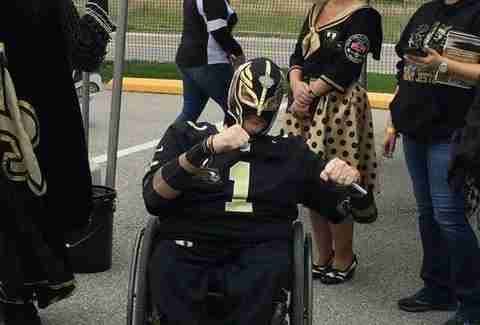 First, he’s the brother-in-law of the late superfan “Saints Fett,” and took on the superfan mantle after Fett’s passing. Like many of the other superfans, Dat Fireman uses his forces for good by being a champion of charities, including St. Baldrick’s Foundation. Taking a page from that other theatrical spectator sport, Mexico’s lucha libre, the Who Dat Luchador is right at home in the 'dome with his wrestler mask and gloves. We love the style and enthusiasm, but donning a mask takes significantly less time and effort than, say, spending two hours carefully crafting intricate makeup and wardrobe. Luchador gets some ups for his energy and unique approach to fandom, though we’re sure he’d rank higher here if he went further with the costume. Is that Stormin’ Norman? Nope... it’s Sergeant Saint, ready to drill your footballs into shape every Sunday in the stands at the Superdome. American football has always had a militaristic vibe, so it only seems appropriate that the Sergeant shows up in the stands with his Kevlar helmet, fleur-de-lis goggles, and festive flak jacket, ready to go to war with the Saints’ opponent of the week. “Sir Saint” might be one of the more bizarre mascots in current professional sports (though not as nightmare-inducing as the NOLA Pelicans King Cake Baby), but he’d be better if he had some horns on his helmet and a bunch of spikes! Well, that’s exactly the costume philosophy of the Who Dat Warlord, who takes a very Jim Henson approach to his superfandom, right down to the foam biceps. He might be a cartoonish figure, but he’s our cartoonish figure, dammit! 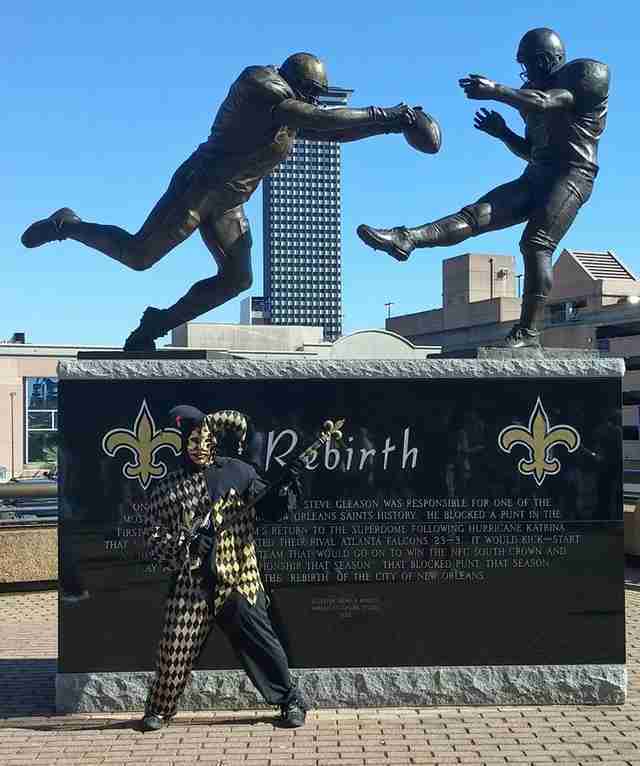 We love Batman and always have, and the transition from Dark Knight to bona fide member of the Who Dat nation seems natural. Despite the cool getup (and how do you get much cooler than Batman? 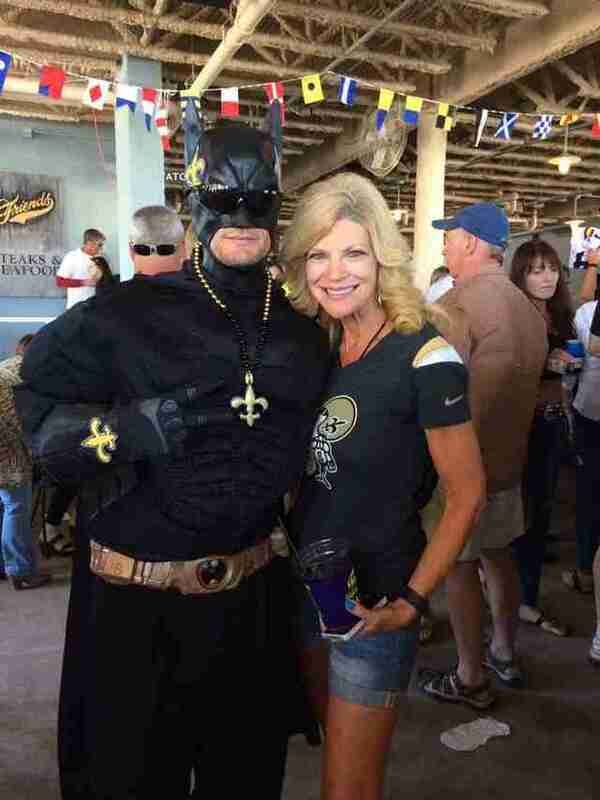 ), the Batman character’s melancholy drive for justice seems a bit at odds with the fun-loving attitude enjoyed by Saints fans. But again, we appreciate the costuming, Datman. 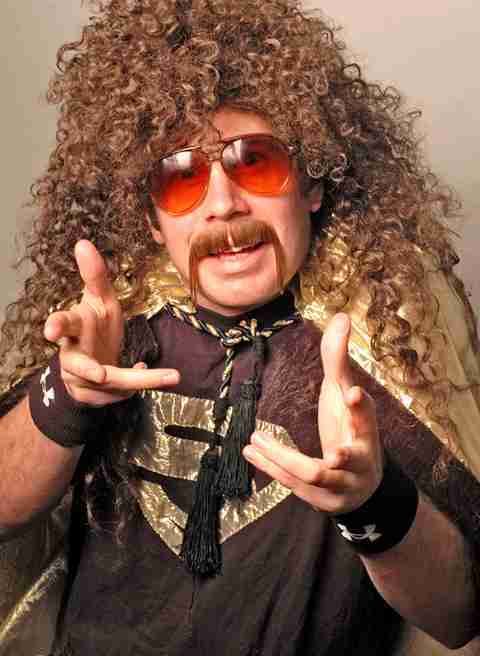 Another “only in New Orleans” superfan comes by way of Supa Saint, “the world’s most deranged Saints fan.” Imagine the love child of Kenny Powers and Superman, and you’d have a broad approximation of what this guy’s mania entails -- from his giant mulleted wig to his gold cape, sunglasses, Fu Manchu ‘stache, and a golden Superman logo on a black T-shirt. It’s almost like Clark Kent’s deadbeat cousin got off parole just long enough to take his Camaro to the Dome for gameday. We’ll toast you by shotgunning a High Life in the parking lot, Supa. You rule. If any city in the nation has soul, it’s most definitely New Orleans. 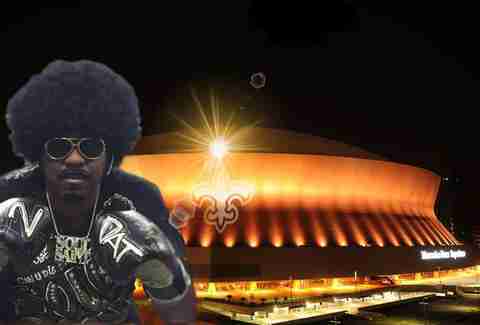 We’re proud to have the soul of the 504 represented at Saints games in the form of Soul Saint, whose festive getup includes a giant afro wig, '70s-inspired facial hair (including a soul patch, naturally), and a pair of black & gold jumbo boxing gloves to prove that this dude means business. It may have started with a generic robot outfit, but superfan Master Chief felt some serious costuming inspiration with the release of Halo 3, and added a little sci-fi gaming flavor. With his unmistakable suit of armor and mirrored helmet, Master Chief is a favorite of Comic Con costumers, and the extension to Saints superfandom seems logical. 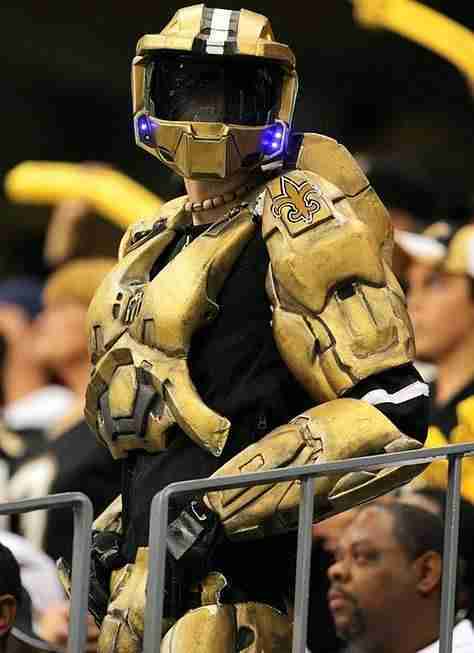 Although there’s no distinct connection between Halo and NOLA, the costume is appropriately powerful and cuts a striking figure in the stands. Hoo-ah, Master Chief! Perhaps the best thing about the dumpster fire of the Star Wars franchise known as Episode One was the creation of Darth Maul, who got pitifully less screen time than his striking visage and general badassery deserved. But NOLA gets to look upon his slightly terrifying countenance every week in the Dome (though in black and gold, and not Atlanta red). The stellar makeup job -- including the freaky yellow & red contact lenses -- makes us proud as a city. It’s difficult to deny the appeal of the Joker, whether or not you go with Cesar Romero’s campy '60s version, the Mark Hamill-voiced animated one, or Heath Ledger’s iconic turn in The Dark Knight. So it seems only fitting that the Joker, with his makeup and mania, should be a Saints fan. The costume and his enthusiasm are admirable, but we can’t help but cut a couple of points off here for his notorious groping of Jimmy Graham in the end zone (even if he did apologize...not cool, bruh). There’s costuming, and then there’s costuming. 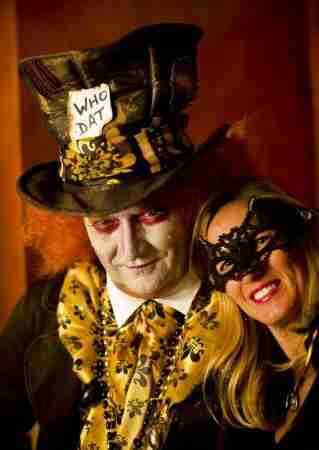 On the more extreme end of the poles lies the Mad Datter, who took Johnny Depp and Tim Burton’s now-iconic look from the recent Wonderland films and dunked it in Saints black and gold. Along with the Joker, it’s easily one of the best and most elaborate getups adopted from film in the entire (superfan) league, which takes the mild-mannered insurance agent several hours to put on every game day. With that striking makeup job and flashy shock of red hair, who could possibly be more appropriate to celebrate the hometown team of a town that’s, well... more than a little mad? Taking the superfan king cake in New Orleans has to be Whistle Monsta, a longtime Saints staple and one of the only fanatics on this list with a wholly original costume that doesn’t pander to existing characters or tropes. 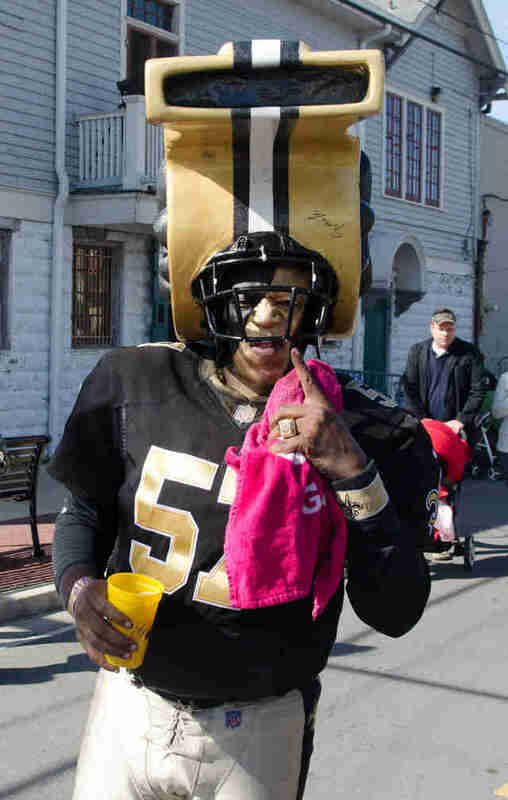 The Monsta, with his giant headpiece resembling a referee's whistle, is something that could only really happen in NOLA, blending our traditions of Carnival mania, costuming, and Saints fanaticism into a single, unmistakable, one-of-a-kind persona. We love you, Whistle Monsta! Wanna hunk-a-hunk-a-burnin' love? Well, if you’re in the Big Easy on game day, you’ll find it in the Superdome in the form of NOLA’s very own version of Elvis. What’s most remarkable about the Who Dat King is not only his 100% commitment to the role, but his eyebrow-raising (and lip-curling) similarity to the man himself. Of course, he gets a little help from the wig, glasses, and sideburns, but you can’t really fake a natural lantern-shaped jaw, nor that unmistakable Elvis hip-sway and swagger. And even though Elvis is famously from Memphis, he did star in King Creole, which makes a nice New Orleans connection for the fan aspect. Dat King’s showmanship, more than anything, is what makes him truly special, and likely why you almost always see him on nationally televised Saints broadcasts. When you affectionately refer to your sports stadium as “church,” as is often the case with the Superdome, it only makes sense that one of your team’s superfans is going to dress like the head of the Roman Catholic Church (it also helps when your city’s predominate religion just happens to be Catholicism). Add to that a famous promo that pronounced, “Bless you boys,” which has long been a favorite anthem of the Who Dat Nation, and the Saints Pope fits in soundly at the Dome on Sundays. 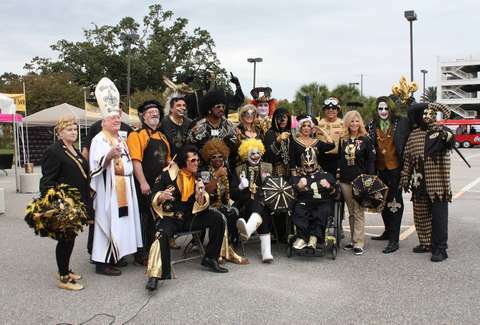 Not to mention the fact that there’s been a “Pope” at Saints home games since 1987, and that he is often credited with creating the entire NFL superfan ethos. Big pointy hats off to you, your Holiness! Scott Gold is a writer in New Orleans who bleeds black and gold. He should probably have his doctor look into that. Follow him for more Saints mania on Twitter @scottgold.